Arun Mullaji is a regular at the “Journées Lyonnaises du Genou” and for the 18th edition of this congress we propose you to meet him. 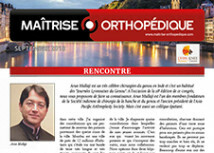 Arun Mullaji is a famous knee surgeons in India. He is one of the founding members of the Indian Hip and Knee Surgery Society and the past president of the Asia Pacific Arthroplasty Society. The number of total knee arthroplasties is growing rapidly. Numbers are predicted to be more than 250,000 per year in the United States by 2030, with a growth of 673%.The number of revision knee replacements will therefore increase correspondingly, whether due to mechanical reasons or infections. In spite of excellent clinical results and an undeniable improvement in quality of life, arthroscopic total knee replacement remains fraught with failure, and the surgical revision rate reaches around 2% after 5 years. Failures are generally due to multiple factors, although the main causes remain mechanical rather than biological. Current clinical outcomes for total knee arthroplasties (TKAs) are good, with implant survival rates of more than 10 years; residual pain is often reported, however, some of which can be attributed to problems with contact between the implant and soft tissue. These problems may be associated with malposition of the prosthesis or with the footprint of implants whose condyles are wide. Patellofemoral instability (PFI) is one of the causes of total knee prosthesis (TKP) failure. It may be responsible for most patellar complications, such as anterior pain, abnormal wear or loosening of the patellar component, and can even extend to dislocation of the patella. Patella infera (or patella baja) described by Caton, Deschamps et al in 1982, and then by Noyes in 1991, is defined by a patellar index less than or equal to 0.6.1,2 It can be congenital and is therefore not pathological or acquired leading to characteristic symptoms. Knee stiffness is defined as a limited range of movement in the joint. When it occurs after a total knee arthroplasty, it accounts for 14.3% of revisions, behind loosening and sepsis (SOFTCOT 2011). This finding is corroborated in the literature. Stiffness is also a common cause of early rehospitalization. Revision and replacement surgery for total knee prostheses is difficult. The surgical approach and the exposure of the knee - and, in particular, management of the extensor mechanism - are probably the most significant technical elements of the intervention. Orthopaedic surgery, especially arthroplasty of the knee, is a type of functional surgery. The aim is to improve the patient’s condition and, ultimately, his or her quality of life. Complications are never welcomed by the patient, or by the surgeon, even though both parties are well aware of the risks from the very first consultation. Patellofemoral instability after total knee arthroplasty is a cause of revision, with an incidence ranging from 0.5 to 0.8%.1,2 The instability usually presents as partial patellar dislocation rather than actual dislocation. The incidence of patellofemoral instability as a symptom is probably widely underestimated as a result of underdiagnosis and the fact that it does not systematically lead to surgical revision.